I’m a Photographer, Not a Terrorist! is a new campaign group set up by photographers who are fed up with the restrictions photographers face while working on the streets or, in some cases, even fields. We will fight back against the use of terrorism legislation against photographers and the abuse by the police of stop & search powers simply because people are taking photographs. We’ll collect accounts from people who have been stopped and searched or harassed by officials for taking photographs in public places and we have produced a ‘Stop & Search Bust Card’ summarising your rights when stopped under the Terrorism Acts. When the officers performing searches sometimes don’t seem to know the law themselves it’s vital for photographers to know what the police can and can’t do. The police won’t even tell us where S44 (allowing police to stop and search anyone without any suspicion in a designated area) is in force so we’ll be mapping where people have reported being stopped and searched to build up a picture of how the powers are being used and abused. We’ll be doing more than just watching, reporting and raising awareness. After the success of the event outside New Scotland Yard highlighting the Alice in Wonderland craziness of new laws against photographing police officers earlier this year we’ll be arranging more events around the country to expose how ridiculous this legislation is and how pointless the restrictions are in pseudo-public places like shopping centres or Canary Wharf. We are photographers, not terrorists. We need to fight back against this repressive legislation and start a proper campaign for the right to photograph before photography becomes a part of history rather than a way of recording it. The occupation of the Vestas wind turbine blade factory continues with around 10 workers still occupying the offices of the factory in Newport, Isle of Wight. Workers occupied the factory over a week ago after management announced the closure of the factory and a loss of over 600 jobs by the end of the month. Music performed by Seize the Day. Photographers are under attack – job losses in local and national media, picture rate cuts and police repression on the streets. It’s time for photographers to come together and plan and build the best way to defend our profession. London photographers are meeting on Thursday 16 July 2009 at 6.30pm at Headland House to start the process of setting up a London Photographers Branch. If you live or work in London – freelance, agency or staffer – and an NUJ member this is the meeting for you. If you are a photographer and not yet an NUJ member we would like you join us and be part of this new branch. Update: The meeting voted overwhelmingly to form a London Photographers Branch (LPB) The branch must now be approved by the NEC and the next meeting will be in early September to elect a interim committee. This meeting calls for a London Photographers’ Branch to be established. The branch will be open to NUJ members whose work as photographers or as other lens based journalists is carried out in London. The new branch will be active in campaigning against job cuts, rate cuts, restrictions on photography, attacks on media workers across the world and a strong force in recruiting new members to the union. We seek the NECs approval of a new branch. Family’s and supporters of those who died in the Hillsborough disaster march through central London on the 20th anniversary of the event calling for all official reports to be released and a new inquiry set up. From left to right: Sir Geoffrey Bindman, Suzanne Breen, Michelle Stanistreet, Mark Stephens, Jo Glanville and Bill Goodwin. Last night Suzanne Breen, Northern Ireland Editor of the (Dublin) Sunday Tribune, flew in to the NUJ headqaurters on Grays Inn Road to talk to members about the case being brought against her by the Police Service of Northern Ireland (PSNI) under the Terrorism Act (2000) to reveal her sources in the Real IRA. Also speaking were Bill Goodwin, the technology journalist who set an EU legal precident to protect his source in a case brought against him by Tetra. Sir Geoffary Bindman senior lawyer and founder of Bindmans solicitors. Jo Glanville from Index on Censorship and Mark Stephens media and libel specialist lawyer with Finers Stephens Innocent. The panel were in agreement that the the security services use of of journalists as intelligence gathers by using production orders against them was unacceptable and a threat not only to press freedom but in Breens case a threat to her life if she is forced to reveal her source. 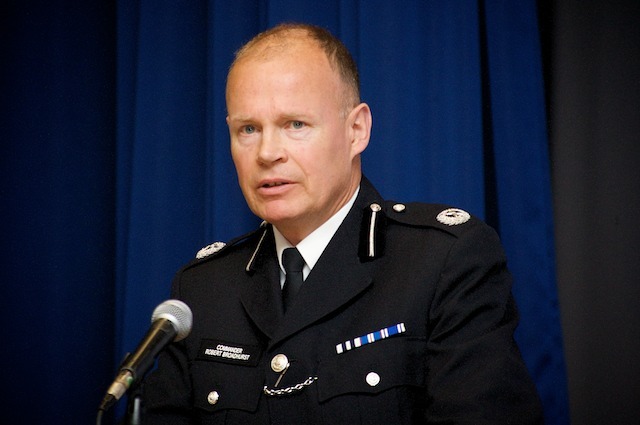 On Monday Commander Broadhurst, head of public order at the Metropolitan Police spoke at the NUJ Photographers Conference and with all the events over the past few years he received a rather frosty response from those there. I don’t know what vetting system there is for holding an NUJ card. Can anybody who has a camera apply for an NUJ card? […] How do we manage who’s doing what? legitimately or otherwise. He went on to question the motives of journalists working in public order situations and it quickly descended into a shouting match between the conference and the Commander. Probably sensing he had dug himself deep enough into a hole he left the platform and went into answering questions. It’s well worth listening to both the Commanders speech and the discussion afterwards as it probably explains a lot towards the treatment of press photographers by police over the last few years. If the man in charge of public order policing doesn’t know how the UK Press Card works it’s little surprise so few police respect it. The South China Mall opened in 2005 to great fanfare as the worlds biggest shopping mall, with 600,000 square feet of retail space over 1500 units. However it has remained mostly unfilled and unfinished, with only 0.05% of the space being leased. It’s developers were under the misguided pretence that if they built it ‘they would come’ unfortunately the site they chose in the suburbs of Dongguan, Guangdong Province meant the only way for most people to reach it was by car, in an area dominated by low paid factory workers. Yesterday saw the last day that the Parliamentary Joint Committee on Human Rights took evidence on the committee looking into Policing and Protest. Vernon Coker, the minister for Policing, Crime and Security was questioned by MPs and you can listen to his evidence here. He gives assurances that after meeting with the NUJ in October new and revised guidance was issued to officers about dealing with the media. We must not under any circumstances unwittingly put ourselves in a situation where photographers, journalists or others may feel that they do not have the right and do not believe that they can pursue their professional job and the public interest. Yet one day before when photojournalist Marc Vallée and videographer Jason Parkinson were covering a protest outside the Greek Embassy, both were assaulted and restricted from carrying out their jobs by Police. What I find most shocking is not the officer placing his hand over both the journalists camera’s, clearly he’s not read the new media guidelines, it’s when he says ‘Scum’ as he walks away. Not only an incredibly stupid thing to say in front of a camera, but extremely unprofessional to say the least. He was an armed diplomatic protection officer and should definitely know better. Sadly this is the latest in a long series of ongoing incidents of Police intimidating and attacking the press.